A community group has been granted the right to register an interest in buying an Inner Hebridean island. 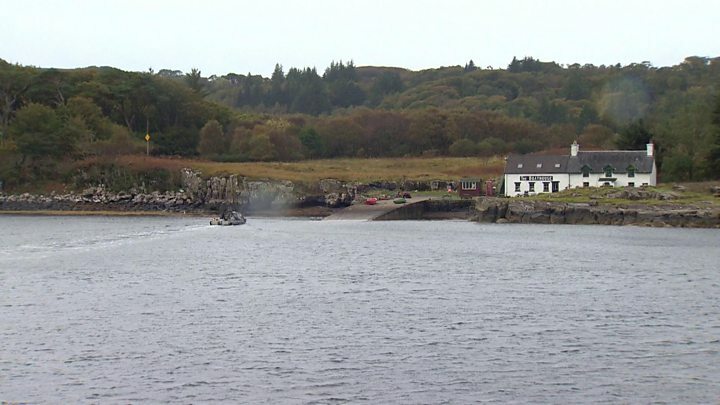 The North West Mull Community Trust wants to buy Ulva so it can attract new residents and increase economic activity. The 4,500-acre (seven-sq-mile) island is off the west coast of Mull. Nicola Sturgeon announced that ministers had given consent to the trust to register an interest during her keynote conference speech. The Land Reform (Scotland) Act 2003 gives communities the right to register and then go on to buy land and assets under certain conditions. Ulva was put up for sale over the summer by the current owner Jamie Howard. Mr Howard, whose family has owned the island for more than 70 years, rents homes to Ulva's six residents. But 200 years ago, more than 500 people lived on the island. While the Land Reform buyout powers have been used across rural and urban Scotland, this is the first time under the current legislation that permission has been granted to a community group to register interest in an island. Land Reform Secretary Roseanna Cunningham said: "The Isle of Ulva is steeped in history and rich in wildlife. At its height Ulva had over 800 residents and now has only a handful, a story which is unfortunately all too common to many of our island communities. "The North West Mull Community Woodland Company is the first organisation to use community right to buy powers to register interest in buying an island. "One of the group's key objectives is to increase Ulva's population and other small communities should take encouragement from the group's ambitious plans."